The springs your garage door uses to support its panels are under a lot of stress. Therefore, it's inevitable that over time these overworked components will develop wear and tear damage, and will eventually break. Trying to deal with a broken spring by yourself can have catastrophic results. Every time you open and close your garage door the metal springs are the ones who support its weight and provide it with tension-based force that allows it to move. This action puts a strain on these components and over time, tiny fractures will begin to form. If left unchecked, these fractures will impact the stability of the springs and their functionality will begins to deteriorate. Eventually, they could snap completely, which will send their powerful metal coils flying across your garage, creating a real risk of injury and damage. Whether you have a pair of extension springs or one single torsion unit installed, replacing these components is a dangerous process and it must only be carried out by an expert. The springs that operate your garage door are designed and manufactured to provide long years of hassle-free functionality, and with a little TLC, you can ensure you're getting the best and most prolonged usage out of these components. Regular inspection and maintenance doesn't take much effort and involves merely checking the springs for damage and applying them with a little grease or oil once or twice a year. As with all moving metal parts, climate will play a role, with extreme warm or cold temperatures determining how often these checks should be carried out. Depending on how often you use your garage door, the springs should be good for up to 7 to 9 years, as long as they undergo regular maintenance. It's important, though, to take note of any change in the appearance and functionality of these components. Signs of over-stretching, bending, or cracking should be taken seriously, and addressed before their condition can deteriorate further. 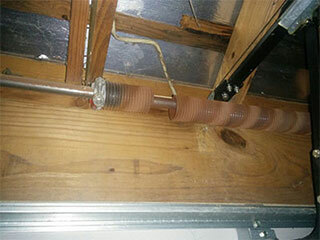 Replacing faulty garage door springs is NOT a matter of DIY. The potential for damage and injury is just too great, and we highly recommend that you call in our experts when faced with such a problem. Our team at Garage Door Repair Pasadena has years of experience performing the replacement and maintenance of both torsion and extension springs. Contact us today to have our technicians help you out.